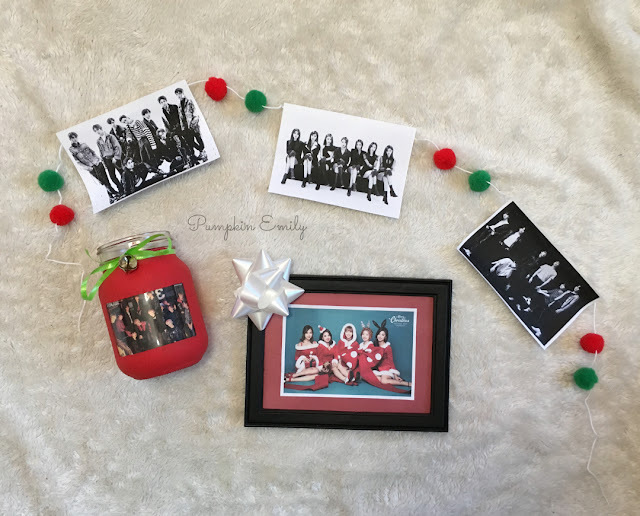 In the video and in the post I'm going to show you how to make three kpop inspired Christmas room decoration ideas. 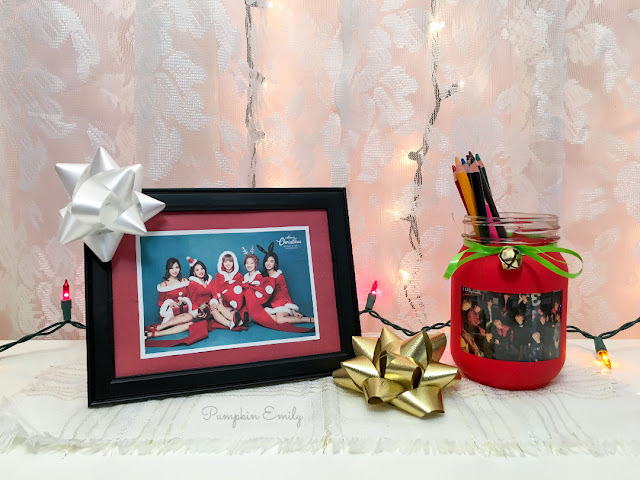 I'll show you how to make a kpop pom pom banner, a kpop picture frame, and how to make a mason jar with a picture inside. 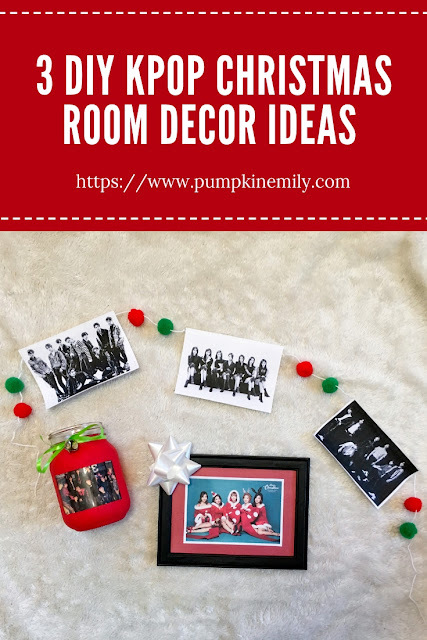 All of these make amazing DIY Christmas room decorating ideas for any room and they're easy to make. You can learn how to make these by watching this video or read the rest of the post. 1. 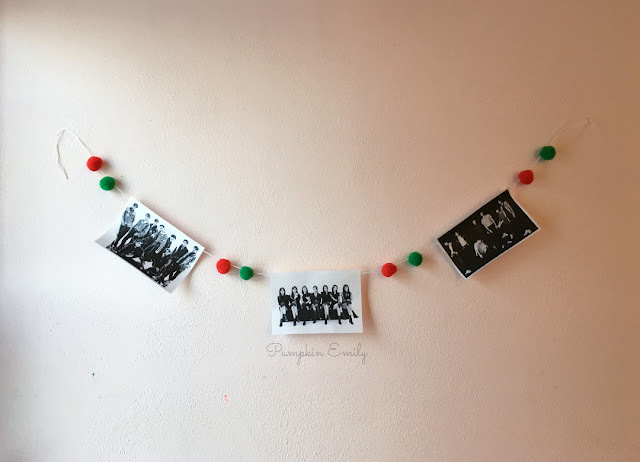 You want to get some pom poms that are red and green or another color and you're also going to need to print and cut out some pictures of any artist out of paper. I put EXO, CLC and BTS on the banner. 2. Once you have your pictures and pom poms you want to lay them out so you'll have an idea of how your banner will look. 3. Put any color of thread onto a sewing needle. I used white thread. 4. After you get the thread onto the needle you want to put each pom pom onto the needle and then you want to push each pom pom onto the thread. You want to continue doing this until you have all of your pom poms on the thread. 5. Space the pom poms out where you want them to be and then you can tape on the pictures. 6. Tape the banner onto the wall or somewhere else and you're all done. A picture of any artist that will fit in the jar. 1. Cut a piece of painters tape to the same size as the picture you want to put in the jar. 2. Get a jar with no writing on it and then you want to put the piece of tape onto the front of a jar. 3. Paint the jar with one or more coats of any color of acrylic paint. Make sure you put a scrap piece of paper under the jar so you don't get paint on anything. 4. When the paint is dry you want to carefully pull the tape off of the jar and if you're having trouble getting the tape off of the jar you can carefully use an x-acto knife to help peel the tape off of the jar. For my jar I took an x-acto knife and went around the tape so the paint and the tape were no longer connected and the paint won't pull off when I pull the tape off. 5. Once the tape is off of the jar you can clean off any paint that got under the tape by carefully scratching it off with an x-acto knife or carefully washing it off with water and a paper towel. If any paint came off you can add more paint in spots where the paint came off. 6. Once you like how the jar looks you can take a picture of any artist and put tape on the picture with the sticky side of the tape facing the front side of the picture. 7. Stick the picture in the jar. I put SEVENTEEN in the jar. 8. If the picture doesn't fit exactly in the window of the jar you can carefully scratch some of paint off with an x-acto knife so you can see more of the picture or you can add some more paint so you can see less of the picture. 9. The last thing you can do is to tie a piece of ribbon onto the jar. Then you can put a bell onto the ribbon and then you can tie a bow. I used green curling ribbon for my bow and the bell is optional. 10. When you're done with the jar you can put anything that you want into the jar and you're all done. 1. Trace the glass of the frame onto a piece of scrapbook or cardstock paper of any color and then you want to cut it out. 2. Once you're done cutting out the paper you want to put it into the frame and don't put the glass into the frame yet. 3. Print out a picture of any artist that's smaller than the paper that's in the frame. I put TWICE in the picture frame. 4. Glue the picture onto the middle of the paper that's in the frame with some Mod Podge and a paintbrush. Then you can put the glass back into the frame. 5. Glue a bow onto the frame with hot glue and you're all done. 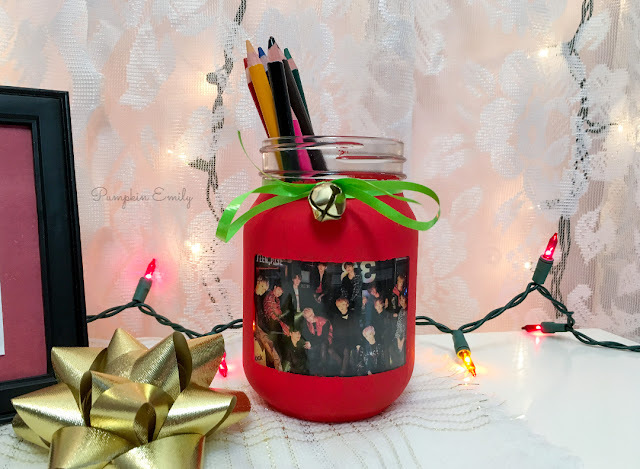 The photo jar looks cute. I might try it!